The worldwide only three-dimensional therapy system for core muscles that systemically integrates coordinative and proprioceptive aspects. 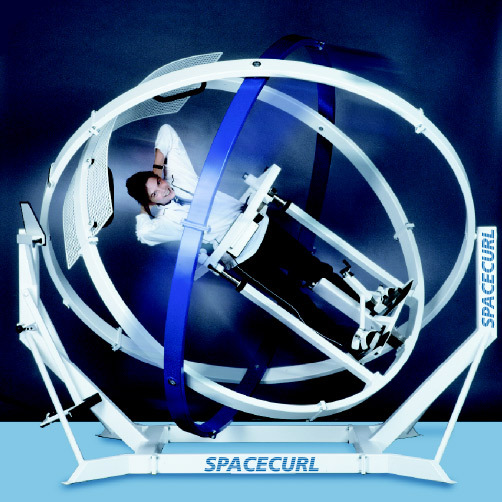 Requirement for the use of the SpaceCurl is knee-stability. If not available, compensation by adaptive knee-stabilizers (optional accessory) is possible. The SpaceCurl is a medical product „Made in Germany“, for which only highest quality and practically proven components are used in production. Our specialists will build up your SpaceCurl on site with skill and care. We manufacture our SpaceCurl in Germany and ship worldwide by fleet or send in special wooden transport-container. From consultation, installation to maintenance and training, we take care of everything around your SpaceCurl. Users must be certified and legitimated by the Physio-Boerse in a one-day training. SPACECURL for children - KIDS 3D - 17.489,00 € without tax!!! Get in contact with us for a free consultation and non-binding offer!